Lamb's quarters is an annual wild edible that is a member of the Amaranthaceae family; in the genus Chenopodium.It was once thought that lamb's quarters was native to Europe. However, recent archaeological studies show that the seeds were stored and used by the American Blackfoot Indians during the sixteenth century. It is a purifying plant and helps to restore healthy nutrients to poor quality soil.This unique plant tends to spread quickly no matter the soil condition. One lamb’s quarter plant can produce up to 75,000 seeds. Distinguishing Features: Annual plant that looks dusty from a distance due to a white coating on the leaves, and when moist, water simply beads and runs off. 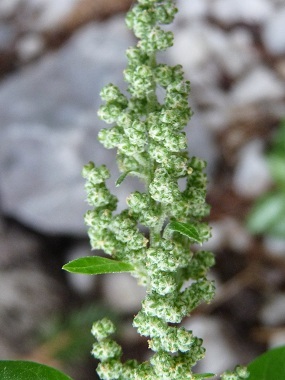 It produces tiny green flowers that form in clusters on top of spikes, and the leaves resemble the shape of a goosefoot. Flowers: Lamb's quarters flowers are very small, greenish, densely grouped together into small, thick, granular clusters along the main stem and upper branches. They have five green sepals but no petals. They produce small seedsrounded in outline, somewhat flattened, 1 to 1.5mm (1/25-1/16") in diametre. Flowers from June to August. Fields of Nutrition has medicinal benefits and vitamin/mineral content of Lamb's Quarters. 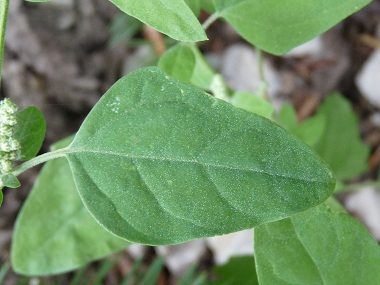 Leaves: Leaves are light green on the top and whitish underneath, some teeth along edges, are goosefoot-shaped or somewhat diamond-shaped and can grow up to 10 cm long. Height: Although rare, this plant can reach a height of up to 2 metres. Average height is about 1 metre. Habitat: Lamb’s quarter thrives as a common weed in gardens, near streams, rivers, forest clearings, fields, waste places, and disturbed soils. It is very hardy and grows in many areas throughout Canada and the U.S. It is also found in South America, Central America, many countries throughout Africa, the Middle East, Europe, several Asian countries (very common in India), Australia and New Zealand. Edible parts: Leaves, shoots, seeds, flowers. Saponins in the seeds are potentially toxic and should not be consumed in excess. 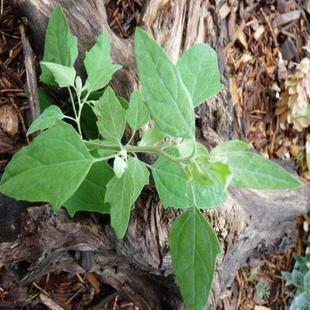 Lamb’s quarters contain some oxalic acid therefore when eating this raw, small quantities are recommended. Cooking removes this acid. Lamb’s quarter can be eaten in salads or added to smoothies and juices. Steaming this edible weed is one method of cooking, or can be added to soups, sautés and much more. Drying this wild edible is one way to add this nutritious plant to your meals throughout the winter or you can blanch and freeze the leaves.